Many people are unaware that Ottoman cuisine is distinct what from we typically associate with Turkish cooking today. In the days of the sultans, food was a serious endeavor. Legions of chefs were employed in the palaces of İstanbul, preparing intricate meals for thousands of people at a time. These chefs were influenced by the different regional cuisines brought into the empire over the years of conquest. They incorporated diverse ingredients and developed new cooking techniques, producing unique creations like restiyye, mahmudiyye and kavun dolma. The commanders of the main divisions were known as the Soupmen, other high ranking officers were the Chief Cook, Scullion, Baker, and Pancake Maker. The huge cauldron used to make pilaf had a special symbolic significance for the Janissaries, as the central focus of each division. The kitchen was also the center of politics, for whenever the Janissaries demanded a change in the Sultan’s Cabinet, or the head of a grand vizier, they would overturn their pilaf cauldron. “Overturning the cauldron,” is an expression still used today to indicate a rebellion in the ranks. Although its influence endures, Ottoman-style restaurant are rather uncommon in most Turkish cities, including Ankara. 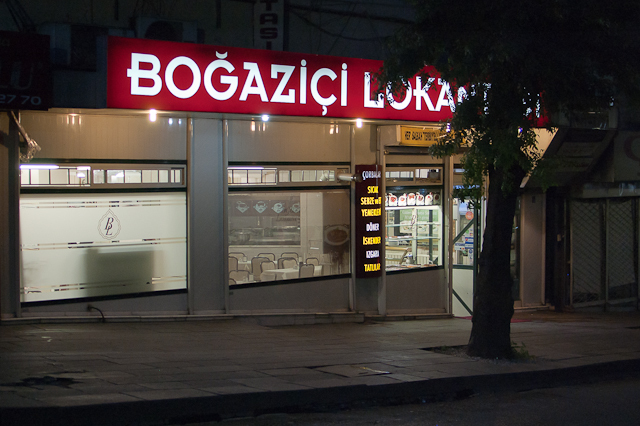 Through a recommendation from the chef at Akdeniz Mutfağı in the Bilkent Hotel, I found Boğaziçi Lokantası in Ulus. It has received many accoldades, including a feature on NTV by Vedat Milor, one of the most respected Turkish gourmets. Surprisingly, though, my friends and I found our dinner to be quite bad, unremarkable at best. We failed to see anything in the food that was worthy of the laudatory newspaper clippings affixed to the walls. Part of me wants to say that my palate isn’t sufficiently tuned to the intricacies of Ottoman cuisine. I’m never been one to claim any particular culinary expertise. But I don’t think my taste is the problem in case of Boğaziçi Lokantası; I think it just isn’t that good of a restaurant. The food at Boğaziçi is pre-prepared and kept simmering on a stove top in a manner similar to the famed and very excellent Çiya Sofrası in İstanbul. In order to sample the breadth of the restaurant, I asked the manager to bring a mix of the best selections for the table to share. What we each received was a single large plate filled with what I would estimate to be six items or so. I’m not completely sure since they all sort of bled together, yielding something that I can’t help but describe as a blob of Ottoman food. The arrangement made it impossible to differentiate between flavors. But to be honest, I don’t think there were actually many worth distinguishing. The meal became even worse when the check arrived. Our mixed selection with a few waters, ayrans and salads for the table came to 30TL ($19.25 at 1.56TL/$) per person, an absurd amount of money for a restaurant in this section of the city and, in general, for food of this quality. We initially thought that we had been scammed (since we were a group of six yabancıs), but after consultation with Deniz from Yemek Lazım, a great authority on Ankara dining, I learned that Boğaziçi is indeed this expensive. Boğaziçi Lokantası is located on Denizciler Cad. in Ulus (Google Maps). There is another branch is Gaziosmanpaşa on Vedat Dalokay Cad.